I feel like I had been waiting for prom for an eternity but just like that it came and went. It was a wonderful time full of fun and pretties. On the right here you can see me, posing awkwardly for some solo shots haha. 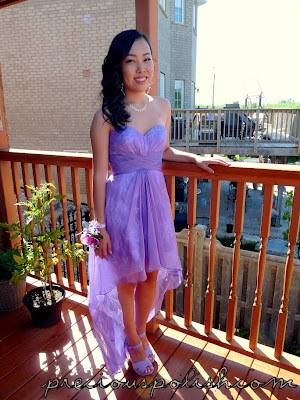 My prom dress is a strapless high-low style in a light purple colour with a sweetheart neckline. There is a layer of white lace underneath the sheer purple overlay. It wasn't the kind of dress I expected to end up with but I really do love it. My shoes are some of the most comfortable heels I have ever worn (bonus!) since they have both a platform and a chunkier heel. I got really lucky in finding them- they match my dress perfectly! It's not in this photo but I had an Alexander McQueen look-alike for my clutch. A gunmetal colour with those cool skull rings! I started off with Seche Chemise. I sponged on Love & Beauty Orchid, followed by a silver glitter from Love & Beauty and Nicole by OPI One Less Lonely Glitter. Oh you look stunning here and the nail are just perfect for the dress. Hehe! :$ Thank you, as always! Thank you! The shoes are from here: http://www.littleburgundyshoes.com/ca-eng/women/sandals/heels/89071517-pendrak/52 and my dress is by a brand called Faviana!